Welcome to Professional Optical Service Inc, providing optical services in Charlottesville, Albemarle, Greene, and Fluvanna VA. When you simply want to update to the latest trend in eye wear, our team of professionals will happily be able to assist you. 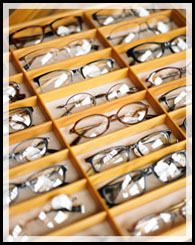 We offer general eye care services such as check-ups and more. At Professional Optical Service we’re proud to offer a better price than most other retailers in the Charlottesville, VA area on eyeglass prescriptions and more. We offer a large selection of sunglasses and sport glasses and carry many brand names and styles. At Professional Optical Service we have been providing eyeglasses for residents in Albemarle, Charlottesville, Greene, and Fluvanna for many years. All prescriptions are filled for Children and Adults. We can help with those on the spot repairs and adjustments. If you’re looking for stylish new eyeglasses, sunglasses or more, call us today to book your eye exam with one of our professionals. Healthy eyes mean a healthy outlook on life, and it is our job to make that happen. Copyright © Professional Optical Service Inc, 2011. All rights reserved.